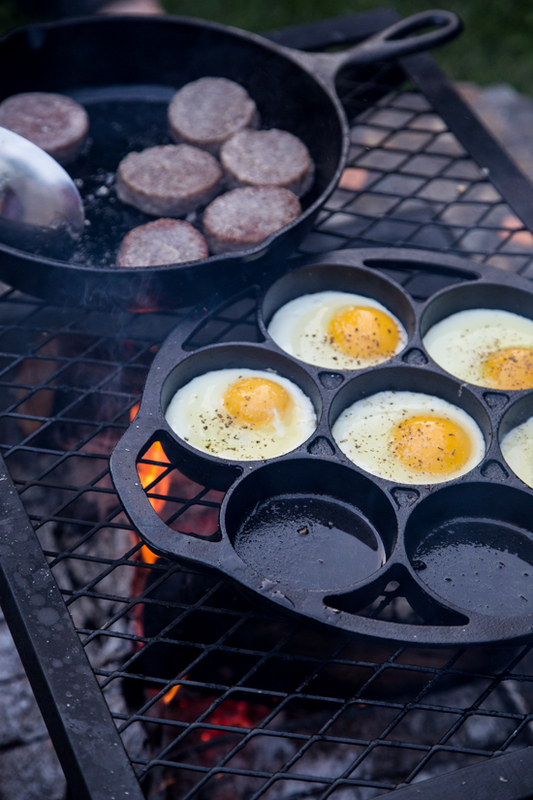 Mmm, this sounds like the perfect camping breakfast. I am so inspired to get my kiddos out there for a camping trip this summer. Camping is so much fun! I am totally wanting to know what you would make on your camping trip, Katie! Ugh! I’m obsessed with that pan too! These campfire burgers look innnnncredible! You seriously camp like a CHAMP! We must go camping together, we must! Loving this #BurgerWeek idea! Can’t wait to see what the week has in store! We should go camping! The food would be awesome, that’s for sure 🙂 Also – you need this pan! I love this idea and I’ll be camping soon 🙂 Thanks. Oh, my word. You’ve outdone yourself! This makes me want to go camping, just so I can have one. My son was looking over my shoulder, and drooling. (His bagel was very unexciting this morning. haha) Gorgeous! Wow I don’t think there is a more perfect breakfast! 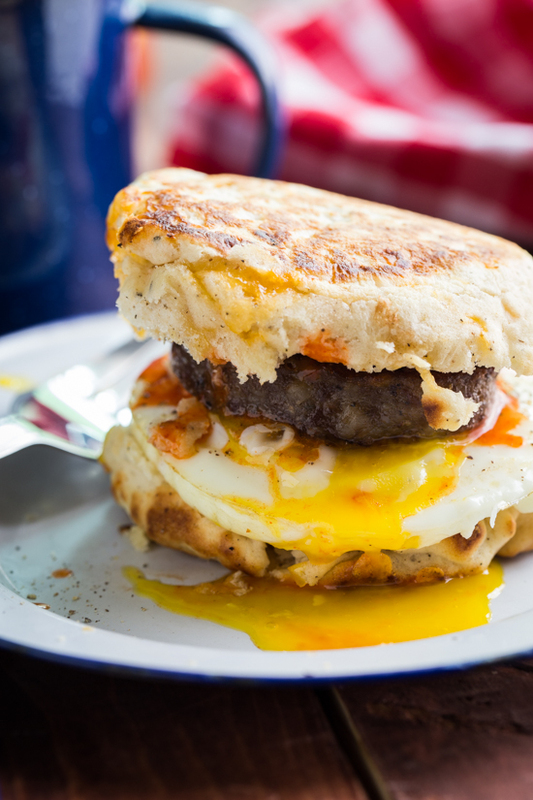 I can just imagine the smoky flavor on these breakfast burgers…nicely done! My word! I want to camp with you! This looks outstanding! Camp food is the best! Love this! I need that pan for sure and this breakfast burger sounds outstanding. YUM! This is the ultimate brinner! Pinning and keeping this in mind for our upcoming camping trip, for sure (if I can wait that long ;)). Okay, that little drop biscuit pan is the bomb! 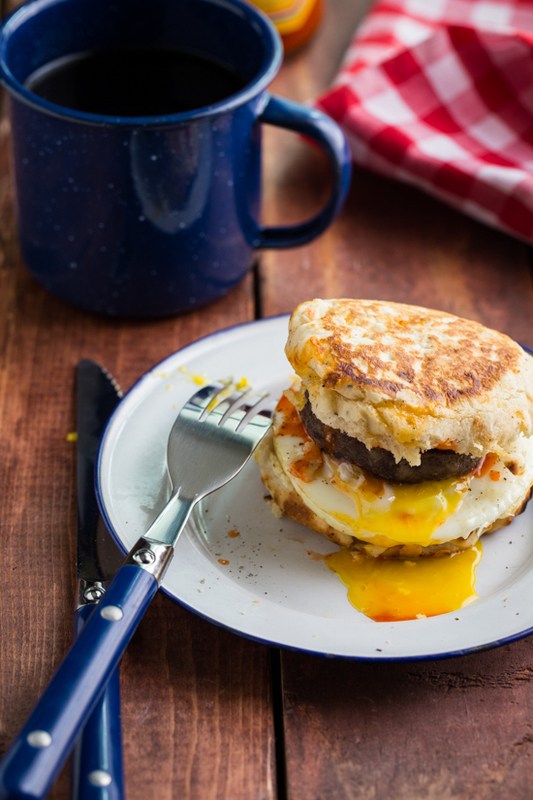 And these breakfast burgers are amazing, I want one now. Oh my goodness, I want to go camping just so I have an excuse to make these! This is my first time visiting your blog, and I love it. Thank you for sharing! This is so brilliant!! My sister camps all the time and I just sent it to her. PS: I want your biscuits! 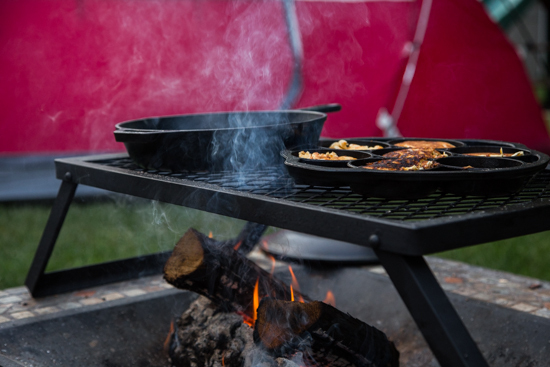 I never camped as a kid, but my husband grew up camping and luckily is pretty good at all of the camping type things 🙂 I have loved learning how to harness the power of the campfire for delicious treats 🙂 You need to try this, Laura!! I cannot believe you made these LITERALLY over a campfire! So impressed! Thanks so much, Nicole! 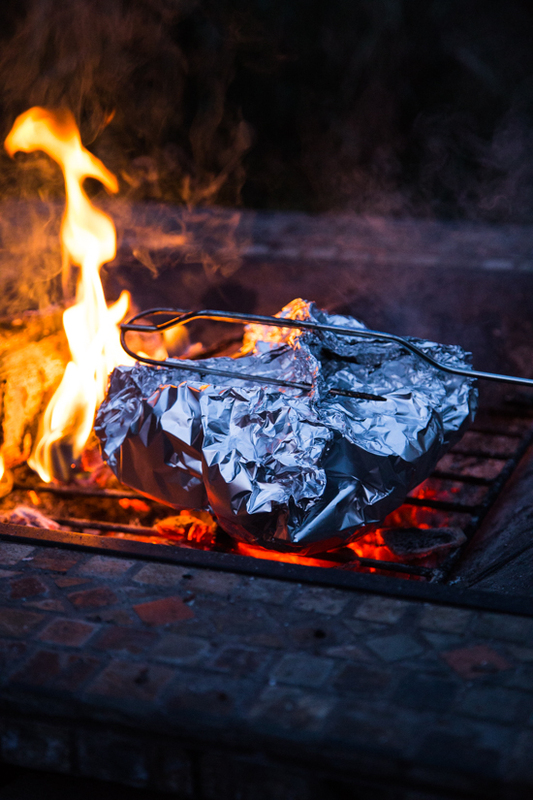 The campfire can be a tricky thing, but nothing beats that smokey flavor! These look so good! 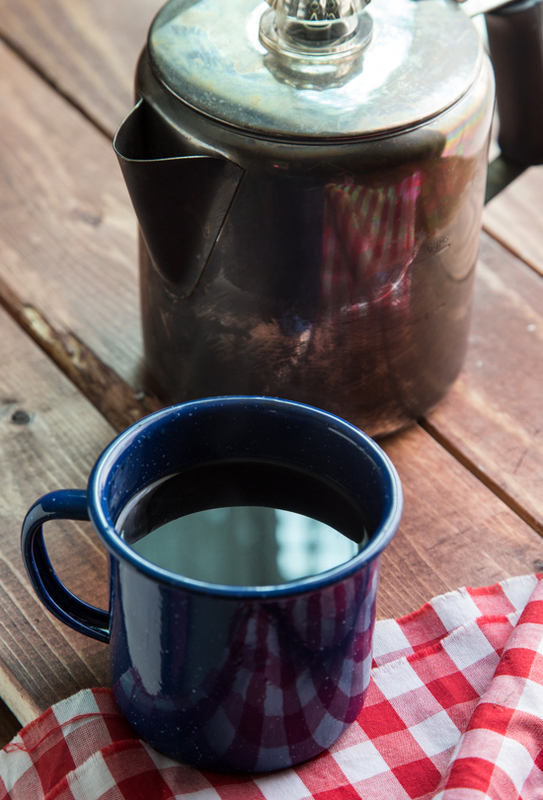 It makes me want to book a camping trip right now just so i can put them on the menu! Man, I want to go camping with you! That pan is so awesome. You’ve basically made a homemade version of my favorite Mickey D’s meal. YUM! Hi there, this looks absolutely fantastic! I think I have the same fire pit as yours, and I would like to know what grill grate you are using for the pans that fits over it so nicely. Thank you! Hi Lauren, The grill grate we bought at Bass Pro Shops but the brand of it is slipping my mind. We found it in the camp cooking section and it’s a grill grate that has fold out legs. It works great to cook directly on or to use as a ‘stove top’ to put your pans on. I hope that helps! Thanks so much for stopping by! These look so good. What do you use to turn them and get them out of the pan? I always end up mutilating my eggs when trying to get them turned. I usually don’t turn them in the pan, but rather cover them with the lid for a few minutes to get the top cooked. I either use a silicone spoonula type tool to get them out. Something that fits into the little shapes of the pan. Thanks for stopping by! Any tips for flipping the biscuits? Just tried this and ended up destroying 5 out of the 7 biscuits just trying to get them flipped. Hi Emily! Quick question for you…. I am planning on make two batches of the biscuits, one exactly as in your recipe, and one tweaked for peanut butter and jelly biscuits to have in the car on the way home. Would you recommend taking out the pepper and the cheese in order to accomplish this? I’m trying to make things easy by doing prep in advance by getting all the dry ingredients in batches, as I’m a beginner camper. Any help would be greatly appreciated. Hi Emily, I’m a big make-ahead breakfast sandwich and/or breakfast burrito fan when we have a camping trip. 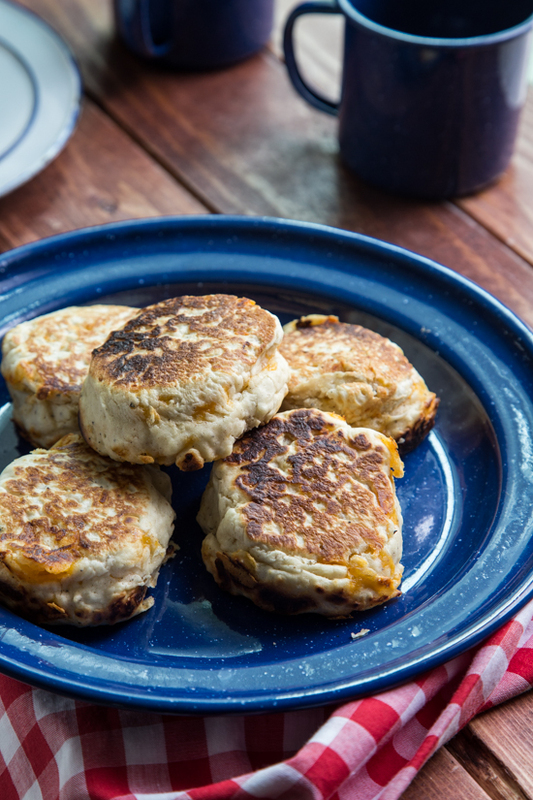 The black pepper and cheddar biscuits sound amazing. Any ideas on time and temperature if I were to bake them ahead of time at home (to assemble at campsite later)? I love a make ahead, too! If you were going to make these ahead, I would recommend doing them on the stove top, just like at the campfire. Thanks for stopping by and good luck! I’ve made these three time already while car camping. What a great recipe. Thank you for sharing! t makes me want to book a camping trip right now just so i can put them on the menu! 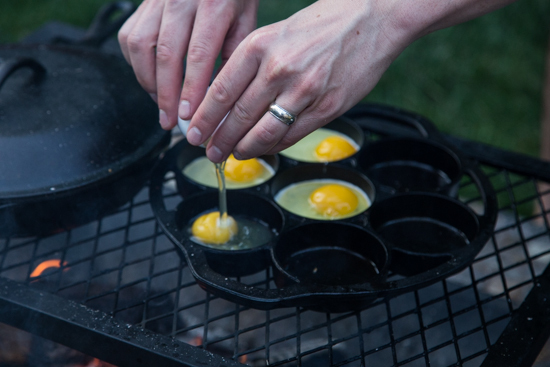 I purchased the Lodge Drop Biscuit Pan for a recent camping trip. I ended up cooking a blueberry crumble/cobbler kind of thing. Next time we will try your breakfast burger. 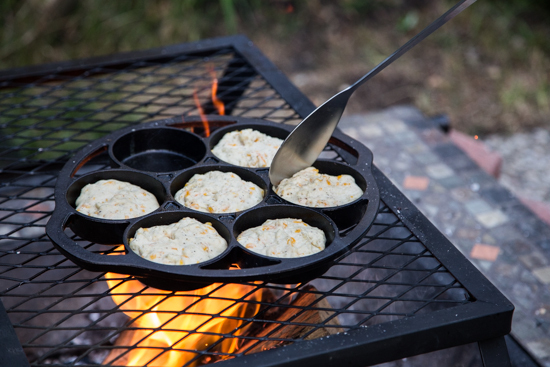 Have you cooked anything else in your drop biscuit pan? I’ve been looking for recipes online and I’m not finding much. I would love to see what else you come up with. The best kind of breakfast in the world.Yumiee. Willing to order this menu in my next trip as a breakfast and enjoy it thoroughly. First of thanks for giving recipe details for home made breakfast in the less time. Eggs looks YUMMY! what a perfect weekend breakfast! This is my first time visiting your blog, and I love it. Thank you for your sharing. 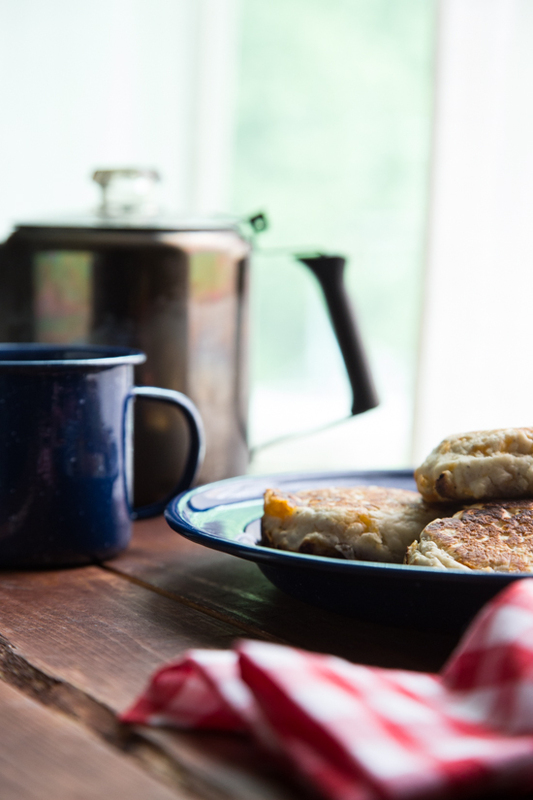 Oh, what a perfect weekend breakfast!Any tips for me to flip the biscuits? Thank you very much, I very like your blog. Hope you keep sharing more. Thanks a lot!!! 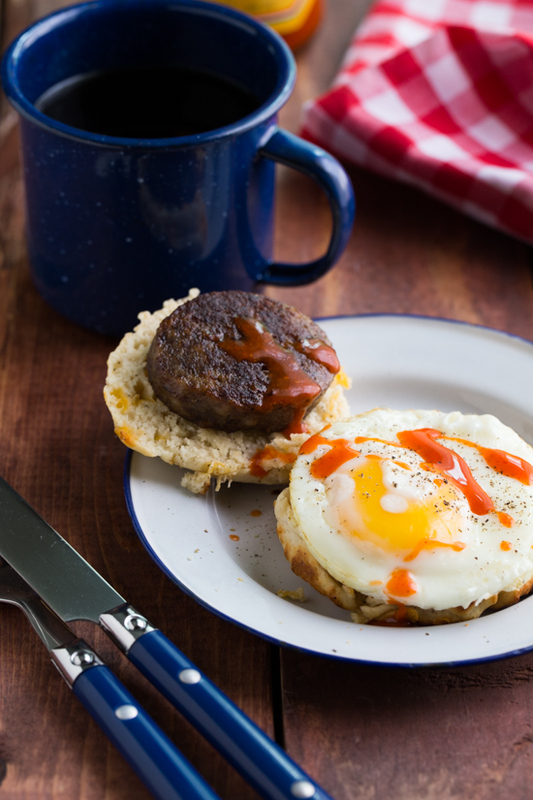 Breakfast Burgers made with homemade black pepper biscuit mix is the perfect, hearty camping breakfast. That’s great and delicious. There the mix isn’t dry anymore. Going camping this weekend and am going to try them. I’m taking the dry ingredients already mixed together. Just need to know if it is water or canola oil or both. Yummy…This recipe sounds fantastic & I love it. This is very easy. Thanks for sharing this recipe.